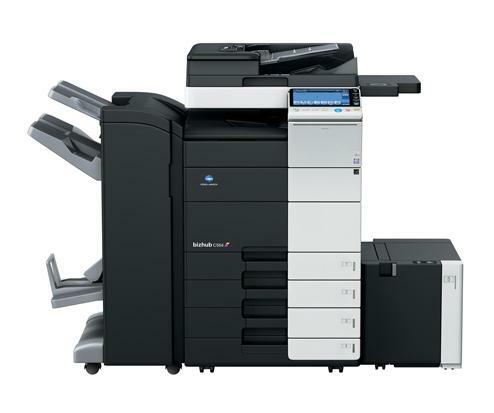 High-speed printing is one of the key features of the Konica Minolta Bizhub C554, which make it ideal for the busy medium-sized or large office. This multifunction printer is also notable for being environment-friendly and cost-efficient to run. It is versatile enough for the growing workgroup too because of the expandable features, but it can be very expensive to purchase and upgrade. The understated but sleek construction of the Konica Minolta Bizhub C554 allows it to fit inconspicuously into any office environment, yet it may require additional installation space because its 100Kg-frame measures 24.2 inches wide, 36.3 inches tall, and 27 inches deep. The front-loading paper handling options include two 500-sheet universal cassettes and a 150-sheet bypass feeder. The device runs on two Gigabytes of memory while being powered by an Intel Pentium 2.6GHz processor. There is a 160GB hard disk drive for easy storage and security features. For connectivity, the Bizhub C554 relies on Ethernet, USB 2.0, USB 1.1, and USB host ports. On-board operation is done via the large colour touchscreen panel. The Konica Minolta Bizhub C554 has a versatile scanner that can save images directly to USB or FTP or scan directly to home or email options. The entire machine runs on less energy for more savings, while the biomass-integrated Simitri HD toner makes it more environment friendly to run. The print speed of the Konica Minolta Bizhub C554 is up to 55ppm in either colour or black-and-white. The device can also be an in-house publishing solution with a range of finishing options for stapling, tri-folding, hole punching, z-folding, and booklet making. The purchase price and the cost of upgrades are the main downsides of the Konica Minolta Bizhub C554 because these can be expensive. It would be better if super G3 fax is a built-in feature of the C554 instead of being optional. Users also need to spend more if they want the EFI fiery controller for light production printing and graphics applications.